Tennessee Crane Hunt Tabled for 2 Years! On Friday, January 21, the Tennessee Wildlife Resources Agency voted to table the proposal to open season on sandhill cranes for two years. More than 100 people packed the Nashville hall to present hunting arguments both pro and con, but the con’s carried the day, buoyed by the thousands of letters, emails, calls and comments received by TWRA since October. Remember my first post in October, when I told you TWRA Commissioner Michael Chase had received exactly one letter of dissent? You changed that. And this just in–the January 2011 count. Well, would you look at that: back down to an unprecendented low. 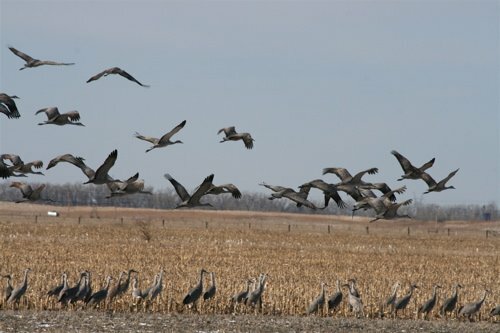 Some biologists are now speculating that the freakishly high January 2010 count was the result of a weather event that froze all open water at Indiana’s Jasper-Pulaski Fish and Wildlife Area, sending the cranes that normally winter there packing farther south to Tennessee. 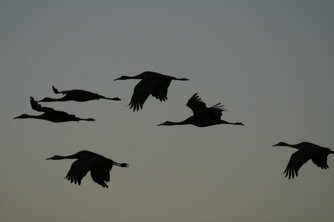 As many as 30,000 sandhill cranes may gather in the Indiana refuge in a big winter. And guess what? As many as 30,000 people may come to see them at J-P in a single season–200 people per day. Sounds like a nice ratio: A crane for every human. But not… a crane in every pot. A flying, calling, purring crane, high overhead or stepping gracefully through the corn stubble. Cranes will be flying, calling and purring, safe from gunshots, for at least two more years in Tennessee. If crane enthusiasts, spearheaded by Vickie Henderson, have their way, they’ll be safe for much longer than that. Vickie has drawn up a petition to the U.S. Fish and Wildlife Service to take another look at its Management Plan for the Eastern Population of Sandhill Cranes. To take the provision for hunting seasons along the Eastern Flyway out of it, at least until more is known about this population’s dynamics, movements, and reproductive viability. Here’s the petition site. Please, sign it. Tell the U.S. Fish and Wildlife Service that you don’t want to see sandhill cranes gunned down in the Eastern Flyway. Oh. And thank you for writing, calling, emailing, voting. I think you know now that you’ve made a difference. Well said, Julie. Thank you and thank you everyone for taking action to voice what you believe! Conservation needs everyone’s voice and I believe this decision will give us more time to insure that the Eastern Population of Sandhill cranes is our first priority in every decision we make. Now go sign that petition, people! FANTASTIC NEWS! Come on everyone (or those of us that value birds for themselves and not just as a target anyway) – let’s get signing! HUGE relief! Thanks to everyone who made this happen! Thank you for your part in all of this, Julie. I feel so relieved, but cautious that we are not done yet, not even close. this is a precious, once-in-a-lifetime opportunity for TWRA to see the cranes as an event, and not a target. There can be so much more money generated from these birds as an attraction than could ever be generated with hunting licenses! It will just take a slight paradigm shift that I think is on the brink of happening. We have two years to regroup and organize and strategize and build a solid wall of will between the cranes and the guns. Sign me up. I was one of the 100 people that attended that meeting. It was a well behaved and civilized meeting. I have never been to something like that, and enjoy seeing what the process entailed. The biologist that spoke and slipped and said there may eventually be a hunt in the Obion Basin on the Sandhill Cranes didn’t realize what he had done. I agreed that Tennessee should celebrate and use the cranes as a way to bring tourism and monies into the state. I also like how one lady from Nashville brought up that Nebraska doesn’t have a hunt and they make almost 2million a year off of the cranes. I did emails and letters and I felt like I made a difference in my own one person way. I am glad that they postponed the hunt for 2 years, which will give the TOS more time to show that this will be a misfortune to have the hunt, although the hunters that were there didn’t feel that way. I am glad I was a part of that fight! This is such good news and a great reminder why it’s important to make our voices heard. It really matters and makes a difference. Excellent. Thank you for your post. Two years not long enough but it’s a good start. we did it!!! The Cranes will be safe for two years!!!! But there is still work to been done to protect them …. i agree that a lot more research needs to be done and the “right” people need to do this research. We here in TN are already making large amounts of money from viewing the Cranes…. money talks in this economy.. thank you Vickie Henderson for enlightening me on this subject, while i was still living in northern VT. I have been a faithful follower of your blog all along the way… now i am here in TN. and proud of what we achieved! After reading Julie’s letter in Oct. that was the turning point for me. I posted, forwarded the petitions, sent articles, etc. to friends and wildlife organizations around the country! Including a few friends in Canada… these people then did the same sent the info forward, etc etc etc….i feel proud that i was a part of this. I may have stepped on some tender feeling at different “birders” sites, but sometimes you just got to get the info out there. I am a resident here in TN. and a wildlife rehabilitator (VT) and soon TN. I would very much like to focus on helping with the Cranes future survival in any way , be it stuffing envelopes to counting Cranes Etc. and also, this was brought to my attention by Julie, that this may be a victory here in TN, but there are other states in the same boat that need help. Lets help them! Lets sign their petitions and write letters …. we must protect these birds that migrate through this flyway… Just this one note: i was going to move back to VT ( where today is -35) if this hunt passed! It passed, and i am warm all over living here in TN. Thanks everyone who helped!!! What fantastic news! Great job!!!!!! Being a big crane lover myself I have tears of joy right now when reading this. So glad there are people like you around to stand up and do something about this senseless hunt that many states are trying to adopt. Please contact me if I can help with any efforts.